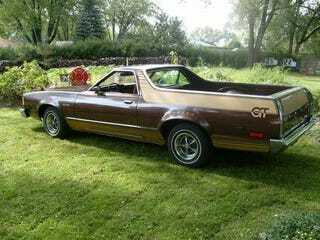 This big brown beauty is a 1978 Ford Ranchero GT. It currently has 61k miles on it, and was stored by the original owner from 1986 to 2006. At that point, the current owner purchased it and has driven it "a couple of times a year since." It has the mighty 351 Windsor V8 and an automatic. The seller has replaced the carb and intake manifold, but presumably will include the OEM parts. It also includes all original paperwork except the window sticker. The only work the seller claims is needed is tires and a rear brake job. The seller's asking price for this ute is $5,000 obo. Is that price business up front and party in the back, or does it make you yearn for something from a newer decade? Post your votes in the comments!